Technological change has been defined broadly as “the process by which economies change over time in respect of the products and services they produce and the processes used to produce them" and more specifically as alteration in physical processes, materials, machinery or equipment, which has impact on the way work is performed or on the efficiency or effectiveness of the enterprise. Technological change may involve a change in the output, raw materials, work organisation or management techniques but in all cases it would affect the relationship between labour, capital and other factors of production. 'A production function attempts to specify the output of a production process (as a function of the various factors of production e.g., labour, capital, technology, management or organisation and land). It may be possible to explicitly state the nature of this function based on econometric studies but that is not our interest at present. We would like to understand the role of technology in the production process and for that purpose we would like to begin with the isoquant approach. An isoquant specifies a range of alternative combinations of two factors of production, say labour and capital, which can be used to produce a given quantity of the output and is based on the assumption that the other factors of production e.g. the state of knowledge of technology is constant. 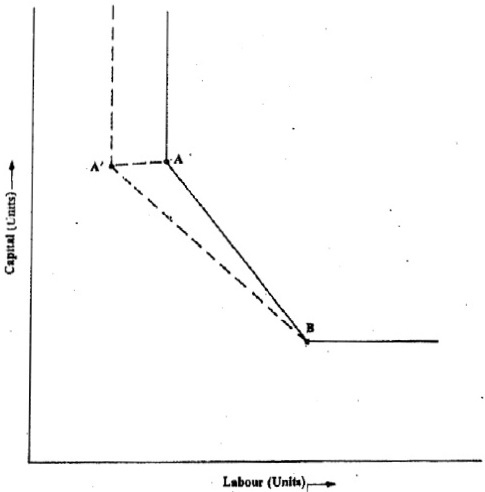 In Figure 3.1 above AB is an isoquant representing various combinations of labour and capital that could be used to produce a specific quantity of the product. If we want to produce a higher quantity of the product, another isoquant can be drawn to represent the various combinations of labour and capital that could be used for the same. 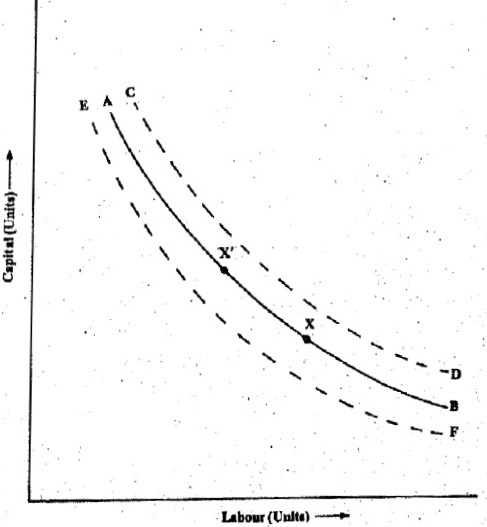 Here CD represents such an isoquant and, as is expected, is above AB since the marginal product of both labour and capital is assumed to be positive in the ranges shown. Similarly, EF is another isoquant and because it lies below AB, it represents an output level lower than that of AB. A closer look at Figure 3.2 would reveal that the technology used to get the isoquant A'B' is superior to that used before the change in technology. However, the corresponding shift in the optimal point from X to Y is, more difficult to interpret. Given the relative factor prices, point X minimises the total cost of production with the existing technology (relevant for the isoquant AB) whereas point Y minimises the total cost of production with the improved technology (relevant for the isoquant A’B’). The difficulty in conceptualising smooth production functions and consequently smooth isoquants - now gets clear. For example, it is not at all obvious from Figure 3.2 above whether the improved technology is labour-augmenting or capital augmenting. Suppose the factor prices were such that the optimum was at P on AB in Figure 3.2. It would appear that the shift in the optimal point from P to Q as a consequence of the change in technology has been mostly of the labour augmenting type since the labour efficiency has improved much more than the capital efficiency. On the other hand, if the factor prices were such that point R on AB was the optimal point and it shifted from S to S as the technology changed, it would appear that the change in technology has mostly been of the capital-augmenting type. In other words, the change in technology can manifest itself as either labour- or capital-augmenting type depending upon the factor prices. A smooth isoquant also implies that there are many (theoretically infinite) combinations of labour and capital at any given level-of technology and so any change in factor prices is immediately reflected in a new optimal mix of labour and capital. This is not generally borne out in practice. In practice, we find that the mix of labour and capital is relatively insensitive to short-term changes in factor prices and is quite well defined for a given level of technology. Similarly, a change in technology is usually associated with a different mix of labour and capital. For example, manufacturing of sugar and khandsari require different mix of capital. It should be pointed out that these mixes of labour and capital are determined more by long-term changes (and expectations of changes) in factor prices than by short-term fluctuations. A smooth production function is incapable of explaining these realities. 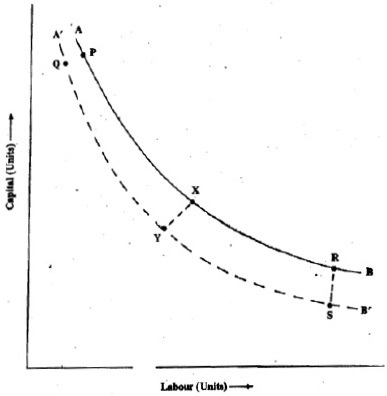 If we change our assumption that the amount of labour and capital can be mixed in an infinite number of alternative proportions (as indicated by an isoquant of the type 'shown in Figure 3.2 above) and assume the other extreme possibility, i.e., that the proportion of labour and capital is predetermined at a given level of technology and is totally immune to any changes in factor prices, we can then show the effect of changes in labour, capital and technology on the same graph as shown in Figure 3.3 below. Each point on the production function represents one process of producing the product and associated with each of these processes is a certain technological knowledge specific to that process. Figure 3.3, for example, shows that there are two different processes available to produce the product under discussion represented' by points A and B -one being labour intensive (viz. B) and the other capital intensive(viz. A). Given different factor prices, each of these processes can be economically viable in different economies. In developed countries, for exmaple, labour is relatively more expensive and hence, capital, intensive technologies are preferred. The line AB is still similar to an isoquant as the combinations of labour and capital represented by points A and B would produce the same quantity of output. Much of the technological change is based on the accumulation of technological knowledge about specific processes. So a change in technology is quite often reflected by a shift in the production function from AB to A'B ambiguous whereas the shift from A to A' is associated with a change in technological knowledge specific to the capital intensive process above. This gives rise to a further reduction in the use of units of labour required to produce the same number of units of output. It has been established in many empirical studies that a choice of technology does exist in the manufacture of many products, although the number of such alternatives may not be as high as perhaps suggested by continuous production functions. Also, the change in technology in terms of both the development of new knowledge as well as its application appears to be induced by long-term movements of factor prices and not so much by short-term fluctuations.